Fans who attend the 2017 Independence Bowl will have an opportunity to leave the stadium with a brand new Ford F-150 pickup truck. 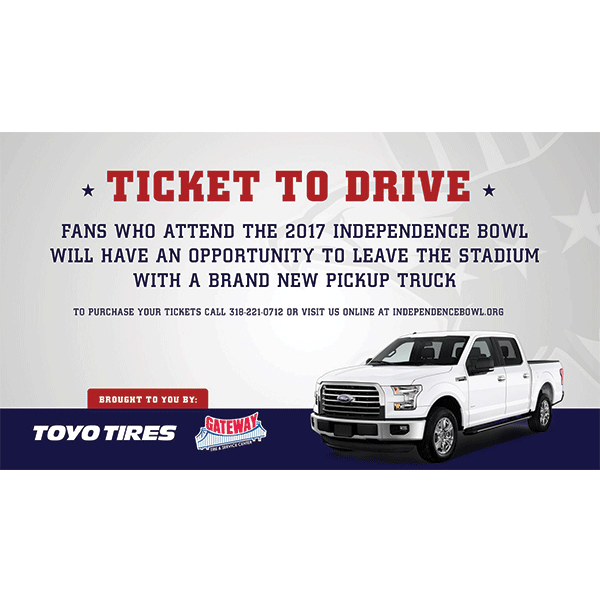 The Independence Bowl Foundation is partnering with Gateway Tire & Service Centers and Toyo Tires to create the “Ticket to Drive” promotional event. Every public and sponsorship ticket purchased to the 2017 Independence Bowl offers an opportunity to win, if the ticket holder is present inside Independence Stadium during the game. Four ticket holders will be selected at random to participate as finalists. Each of the finalists will be given a key, and the fan who possesses the key that starts the truck will win. Tickets to the 2017 Independence Bowl can be purchased online via Ticketmaster by clicking here, or by calling the Bowl office at (318) 221-0712 or toll free at (888) 414-BOWL. Official rules and regulations will be posted on IndependenceBowl.org. Gateway Tire first opened its doors in 1929 as Dunlap & Kyle to serve the wholesale tire industry by bringing a personal approach to a trade where customer service wasn’t always a priority. In 1972 those same qualities were applied to the retail tire and auto servicing industry under the banner of Gateway Tire and Service Centers. The first retail shop was launched in Batesville, Mississippi, and quickly expanded into Arkansas, Louisiana, Texas, and Ohio. Toyo Tires is a trusted, technology-focused global tire brand with an extensive product lineup acclaimed for exceptional performance and quality. The manufacture and sale of tires is the core business of Toyo Tires, who make tire products for passenger vehicles, large vehicles such as SUVs, CUVs, and pickup trucks as well as large trucks, buses, and construction vehicles.